Well done. It was a game worth the wait, worth the hype, and worth watching, live; despite the rain. We lost to a more superior and more experienced team, the Al Azraq of Kuwait. It was victory though for Philippine football. Never has football gained nationwide popularity and recognition in this country which is still more passionate on basketball. The whole world, including our ASEAN neighbors, though, are football crazy. So much has been said about the game. I have to add my take. The game was again lost in the 2nd half. The Azkals played a good fighting first half, punctuated by that classic goal by Stephan Schrock in the closing minute of the first half to go 1-nil.. But the 2nd half was a different story.. It was apparent that the lax on defense did them in. Despite playing with only 10 men after a member was thrown out following a hard tackle on Chieffy Caligdong, the Kuwaitis never panicked . Their short passes were always a threat. Our players was not able to capitalize on the Kuwaitis manpower deficit. They were quite slow in going back to defense after a failed offense. The first goal was a shocker. The 2nd goal was the result of not being able to go back fast on defense. They simply were just passed by a streaking Kuwaiti from the center of the field down to the top of the penalty area. On this one on one situation, goalie Neil Etheridge was forced to go out of the goal and meet the head on the rushing Kuwaiti, leaving the goal wide open. In football, a split second lapse can be punished severely. Most often, this will cost the game. My hats are off to Fil-German Stephan Schrock. He was my MVP. He was everywhere. From defense to orchestrating offense. From left field to center to right field. His defense was superb, spiked by those spectacular saves and tackles. His bullet shot from way out got the whole stadium and the whole country in frenzy and wild jubilation. That shot was a reel highlight. I saw it coming. We were seated just in front of that area and the resiliency of Chieffy fighting for that ball near the corner marker before Shrock got the ball was not lost on me. And have you seen Schrocks' very Filipina looking mother, Maria, who flew all the way from Germany to watch his game? We don't know when we will see another football game of this caliber in the future. There is the Under 23 SEA Games in November this year and the AFC Challenge Cup next year but will be played somewhere else. For now, we hail our heroes, our Azkals, for a job well done. We thank too the coaching staff and the Philippine Football Federation. for making this happen. In a gesture of this gratitude and admiration, we in the crowd, did not leave the stadium immediately after the game. 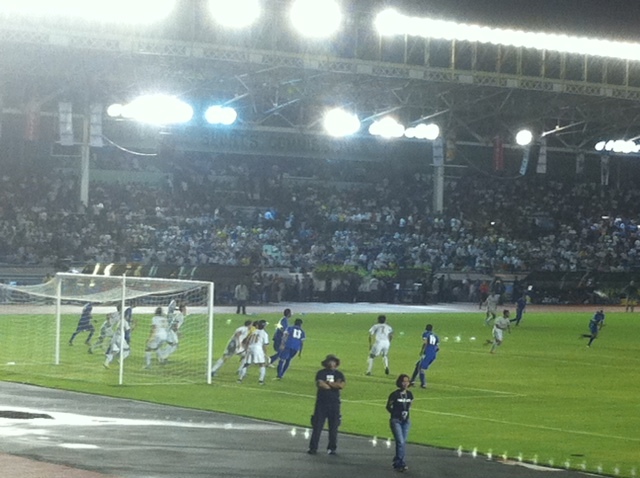 We waited and cheered as our Azkals heroes made their traditional oval run. That was also their way of thanking the Filipino fans for all their support and love of the team. It was a touching moment; for us; and for them too. Football, the beautiful game, has finally arrived in the Philippines.